Following the success of the launch of the Montblanc Heritage Spirit Orbis Terrarum in 2015, Montblanc is now presenting this contemporary and highly appreciated worldtime function in its pioneering 4810 Collection. 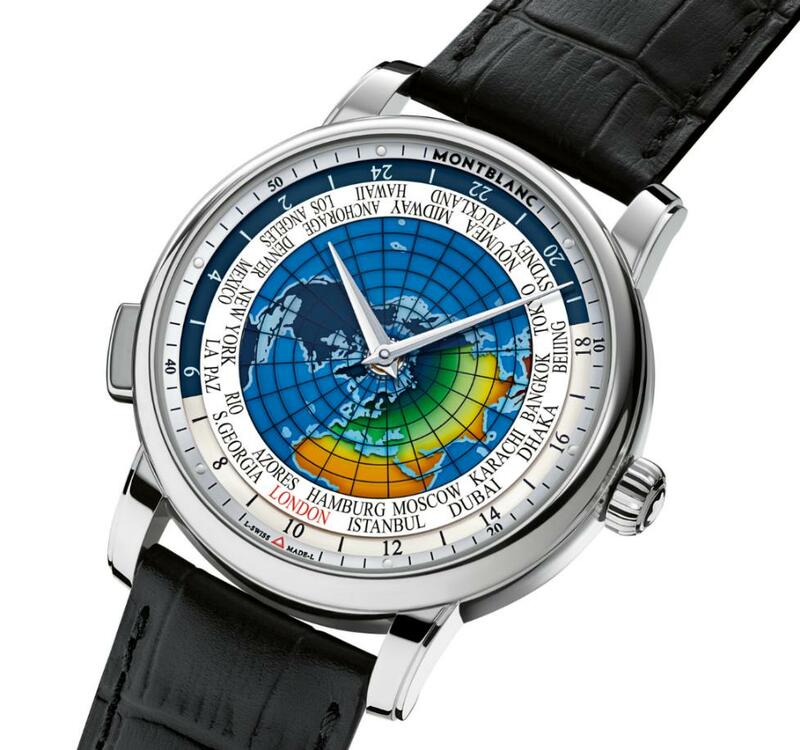 Named after the Latin Orbis Terrarum, which translates as "globe", "earth" and "world", this timepiece tells the time in 24 timezones in an intelligent and intuitive way, thanks to a manufacture complication developed in-house by Montblanc's master watchmakers. 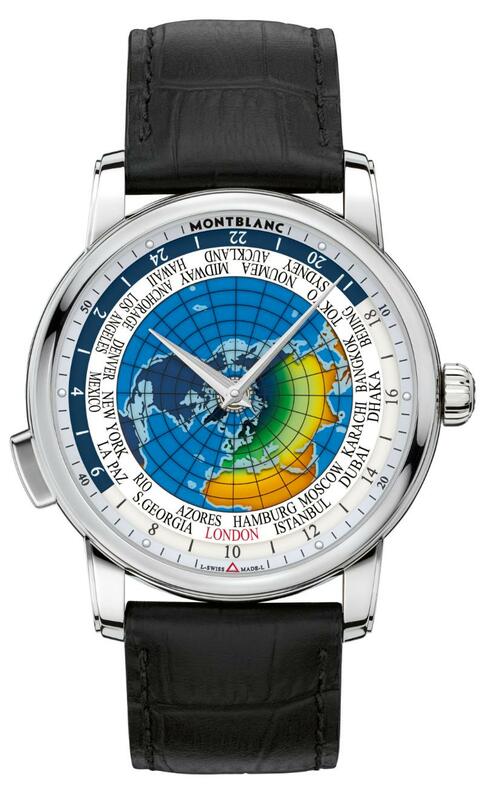 The dial is constructed of multiple layers, starting with the main sapphire crystal disc that displays the continents as viewed from the North Pole and the names of the 24 cities representing the different timezones. The continents are cut out from the rest of the disc that displays the oceans in a light blue colour. A second sapphire crystal disc indicates the passing of day and night with a dark blue for the night and a gradient of yellow and green for the day. This disc also includes the 24-hour ring that indicates the different times in the 24 cities. To adjust the time, the local time city first needs to be positioned in front of the red triangle at 6 o'clock via the pusher at 8 o'clock. Then the hours and minutes (which are always linked with the day/night and 24-hour timezone disc) can be adjusted through the crown to set the correct local time. Once this is completed, the time in all 24 timezones will be simultaneously displayed around the dial. When travelling to another timezone, the new destination city simply needs to be aligned at 6 o'clock. This adjustment is again done through the pusher at 8 o'clock, which automatically turns the hour hand, continents, cities, day/night disc and 24-hour timezones along with it. The hour hand jumps in one-hour increments without affecting the precision of the minutes. Once this easy regulation is carried out, the local time of the new destination, as well as the 24 timezones, are fully synchronized. The case, in stainless steel, measures 43mm x 11.8mm. It has an AR-coated sapphire crystal, a sapphire display back, and it is water resistant to 50 meters. Worldtime pusher at 8 o'clock and the steel crown has an inlaid Montblanc emblem. Movement is the Swiss automatic Montblanc caliber MB 29.20 with 26 jewels, 28,800 vph and a power reserve of 42 hours. Functions are: hours and minutes from the center, worldtime indication with 24 hour timezones and integrated day and night display. The sapphire crystal dial shows the Northern Hemisphere and 24 cities of the 24 hour timezones, 24 hour-disc with day/night display and climate zones that turns under the sapphire crystal dial, rhodium-plated regate hands. It comes on a black alligator leather strap with a steel triple folding clasp.